IMAX theaters have become the standard when seeking the absolute best visual experience one can have when watching the latest blockbuster films. 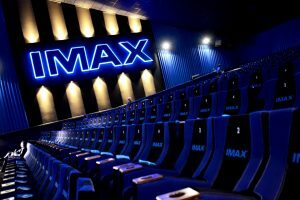 IMAX, which actually stands for image maximum, utilizes a larger film format than traditional systems and provides a higher visual fidelity at 12k resolution. Many theaters continue to upgrade their venues to have a couple IMAX screens but they may have to make room for another type of visual experience in the future: Virtual reality. Via press release, IMAX has announced they’ve completed the first phase of a $50 million virtual reality fund. The press releases details an initiative that will see money invested in higher-quality immersive content geared toward premium productions from their Hollywood studio and filmmaker partners. In essence, IMAX wants to take the progression they’ve made over traditional cinema and make that same leap for VR. The initial push will include the creation of at least 25 interactive VR experiences that will be available across various virtual platforms and also housed in IMAX VR centers. With IMAX involved along with others, an initiative so focused in high-quality such as this will do wonders for VR content’s longevity. We’ve previously reported on location-based VR centers and VR cameras from IMAX and will continue to cover the developments as they progress.